“BACK home, they would shoot me in the head for doing this to hummus,” Majdi Wadi said as he waited to board a flight to Los Angeles, where he would meet with Costco executives to pitch his company’s roster of 14 flavored hummus varieties, including artichoke-garlic and spinach. By “home,” Mr. Wadi meant Kuwait, where he was born, and Jordan, from which he immigrated in 1994, places where hummus is usually a purée of chickpeas, sesame paste, lemon, garlic and not much else. Mr. Wadi, chief executive of Holy Land, a specialty foods producer here, has in the last few years broadened the palette of hummus, and its appeal. 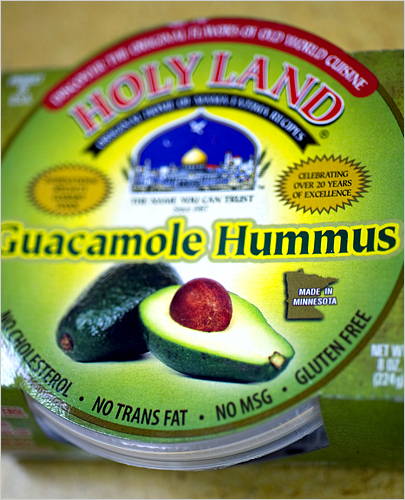 Holy Land opened in Minneapolis in 1987 as a storefront cafe that sold tubs of hummus as a sideline. Back then, Americans didn’t eat a lot of hummus. A staple of the counterculture in the 1960s and 1970s, hummus was long relegated to health food stores and “ethnic” aisles of markets. More recently, though, Americans seem to have decided that this low-fat, high-protein snack with a little olive oil stirred in is not so exotic. Industry giants have joined the market, for chips require dips. In 2008 Frito-Lay North America, a division of PepsiCo, became an owner of Sabra Dipping Company, producer of more than a dozen hummus varieties, including one with salsa. Fifteen years ago, hummus was a $5 million business led by a smattering of companies. Today it dominates its sales category, called refrigerated flavored spreads, which has more than $325 million in annual retail sales, according to Symphony IRI Group, a Chicago market research firm. Sales are up more than 18 percent in the last year, it said. Ripple effects have been felt on American farms, said Peter Klaiber, marketing director for the U.S.A. Dry Pea and Lentil Council in Idaho, which researches and promotes chickpeas. Mr. Wadi said his mother helped create that appetite. Set on a gentrifying retail corridor north of downtown Minneapolis, Holy Land began with a simple product and a shoe leather marketing plan. In the years hence, it has become a leader of the flavored hummus trend. Other companies are also taking liberties with hummus. In Somersworth, N.H., the Crazy Camel company makes six varieties of dessert hummus, including a blend of chickpeas and cocoa it calls chocolate mousse hummus. In North Carolina, Good Health Natural Foods of Greensboro makes Humbles baked hummus chips in four flavors, including one with feta. A Denver company, using the Spanish term for chickpea, is selling Garbanzo Mediterranean Grill franchises, which feature hummus dishes ready to be accessorized with cilantro and green chili sauces. Such variations might rankle traditionalists. But they raise awareness of hummus and create sales. If all goes well with Costco and with Target, which is also considering broader distribution, Holy Land will be a national brand, too. Minneapolis seems, at first glance, an odd beachhead for a Muslim-owned company selling foods inspired by the Middle East. But the cultures share certain affinities. “Muslims care about manners and values,” Mr. Wadi said. “And we are devoted to family, too.” His mother stops in most days to ensure that the production manager, Samer Wadi, younger brother of Majdi, stays true to her family recipe, at least with Holy Land’s baseline hummus product. 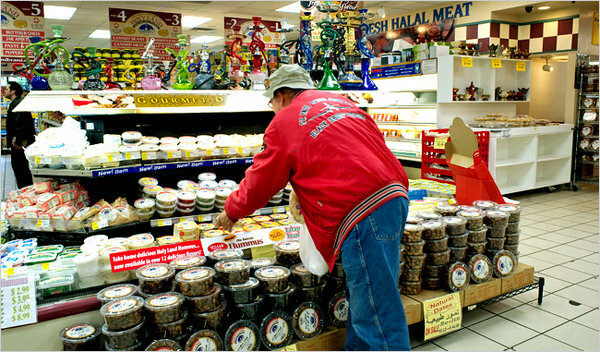 Holy Land began as a small counter-service restaurant and grocery, but after numerous expansions it functions as a crossroad where Turks buy coffee laced with cardamom and Ethiopians in search of injera jostle Egyptians bound for the butcher window to pick up bundles of boneless camel meat. Next door, in a hyper-modern facility, Samer Wadi directs the production of Holy Land’s hummus. Each small batch starts with dried chickpeas, which are soaked overnight. The peas are puréed in a 20-quart Robot Coupe, then flavorings are added in the manner of an ice cream shop clerk putting a rainbow of mix-ins into the vanilla soft serve. At Holy Land, hummus is wholly mutable. The Wadi family sells hummus made with favas to Egyptians accustomed to eating a purée of those beans. They sell Greek hummus in packages blazoned with cucumbers to evoke tzatziki. Soon, the family plans to market hummus mixed with diced habanero peppers to heat-seeking Somalis, a growing local community. That adaptability is one reason the hummus sells well in the United States. Other reasons, as Samer Wadi reminds Holy Land plant visitors, are his product’s absence of cholesterol, its high fiber count and the fact that his hummus is gluten free. While the widespread adoption of hummus is hardly news in New York, where hummus-only restaurants have popped up in recent years, in Minneapolis, as in much of the United States, this reception is remarkable. A widely embraced stereotype here holds that local people are at once open-minded and averse to unfamiliar tastes. “Hummus may be as far as we can go,” Mia Bolte said while food shopping at the Wedge, the Minneapolis co-op that was Holy Land’s first retailer. “We want to try new things. We want exotic. But maybe hummus is all we can do,” making a tongue-in-cheek case for the relative approachability and local popularity of puréed chickpeas. Majdi Wadi believes hummus is a breakthrough product. He talks about hummus as a bridge that spans chasms of ethnicity and religion and culture. And he’s not the only one who sees the possibilities. In a YouTube video, “Hummus: The Rap,” viewed more than 1.3 million times, Remy Munasifi, a Virginia songwriter who performs as Habib Abdul-Habib, sings while playing two chickpea cans like bongos. The rap could work as a Holy Land jingle. Or a call to all peoples to join at the hummus table.